Following on from the first installment - Salisbury Plain and the second installment - Isle of Purbeck this is the third and final installment of the 3 part article Places of Pilgrimage. I was inspired by an article I read by Chris on his blog Wisdom and Life called Your Magical Place, which he wrote after seeing my seed on *Seededbuzz (a blog promotion service) about my article Places that speak to the heart and draw on the soul and it got me thinking about my places of pilgrimage. There are a few places that I make a pilgrimage to regularly, where I have a kinship and need to pay homage. These places are all clustered around three key areas in the South West of England, the Salisbury Plain in Wiltshire, Purbeck Isle in Dorset and Glastonbury in Somerset. However as I begun writing the article it became apparent that to include all the places in those areas would make the article be far too long. So I decided to make this a three part article, today I’m writing about an area that I find most spiritual - Glastonbury. I have always loved the air of magic and mystery that surrounds Glastonbury and not because of the music festival, in fact I’ve never attended the festival and have no plans to do so. It’s the mystical feel to the very land and buildings of the area and in particular Glastonbury Abbey, The Chalice Gardens and Glastonbury Tor. Set within 36 acres of parkland, the ruins of Glastonbury Abbey are a beautiful and tranquil setting and a wonderful place to spend some time sitting and contemplating the world and your place within it. 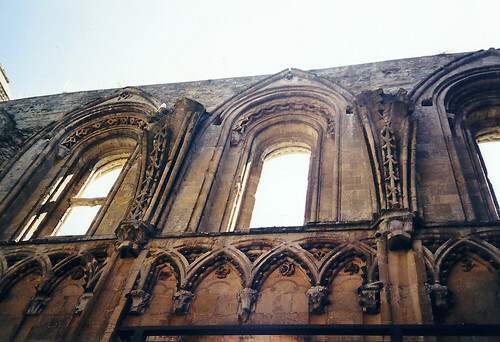 For these reasons and the many myths and legends that have sprung up around it have contributed to the abbey becoming a revered place of pilgrimage over the centuries of it’s existence. 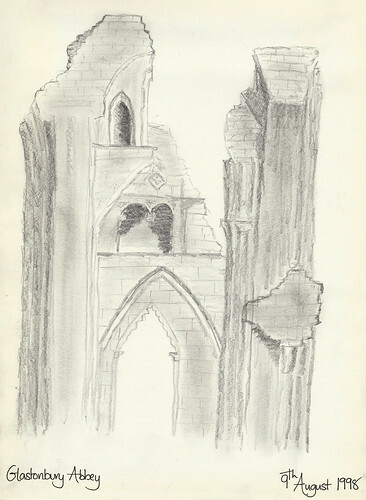 I first visited the abbey on a stunning summer’s day back in August 1998 where I spent many hours walking the grounds, absorbing the tranquility and peace of the place, taking my time to sketch and photograph the ruins. I left that day feeling centred and grounded, peaceful and reinvigorated, ready to face the grind of daily life, which was a rare and great gift indeed. The abbey’s history as a sacred site goes back a long way, starting with the pre-Christian Britons. According to Medieval Christian myth the site was later visited by Joseph of Arimathea who founded the abbey back in the first century around 63 AD. The first stone abbey was said to have been erected by King Ine of Wessex back in 712 and the abbey was built up and extended over successive centuries. The Normans made extensive additions to the buildings until a great fire consumed much of the structures and treasures in 1184. It took 30 years to rebuild, but the popularity of Glastonbury continued apace until the dissolution of the monasteries by Henry VIII in 1539. 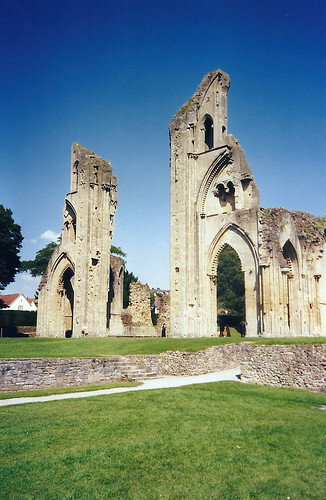 In the same year Glastonbury Abbey was ransacked of all valuables, which were sold off for the King’s treasury and the Abbot Richard Whiting hung from Glastonbury Tor. 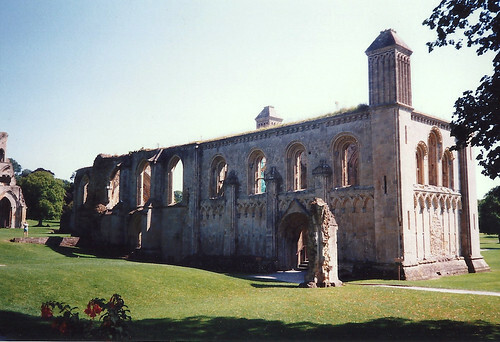 The Abbey then fell into ruin until it was purchased in 1908 by the Bath and Wells Diocesan Trust to preserve it for a new generation of pilgrims. There’s also got the legend of King Arthur which has become intrinsically linked with Glastonbury and the abbey. Many believe that Glastonbury is the site of the mystical Isle of Avalon where Excalibur, King Arthur’s mighty sword was forged and Arthur’s final resting place where he went after being mortally injured and from which he will emerge when the land needs him most. Within the Abbey grounds are a pair of graves which are reputed to be those of King Arthur and his queen, Guinevere. The story goes that in order to raise funds to rebuild the abbey after the 1184 fire, pilgrims went in search of the graves of Arthur and Guinevere in 1191 and the bones of two bodies were unearthed from deep graves on the south side of the Lady Chapel. The bones were finally re interred in their current home many years later in 1278. Regardless of your religious or spiritual beliefs you can definitely feel the sense of awe and power that the grounds have inspired in countless generations of pilgrims and worshippers. The abbey ruins themselves have a majestic presence, they’ve stood against the test of a King’s wrath and the ravages of time. If you get the chance to visit the Abbey I promise you won’t be disappointed. On the outskirts of Glastonbury, on the main route into town is one of the most beautiful, enchanted and sacred places on the planet. Archaeologists believe that the well has been in use for over 2000 years. Since 1959 the Well has been under the stewardship of the Chalice Well Trust that was set up by Wellesley Tudor Pole. The gardens are well maintained and there is a small, but interesting gift shop and regular events for those of a spiritual nature. The Chalice well is a natural spring which has been regarded as holy site of pilgrimage due to the water’s purported healing qualities. People of diverse faiths, spirituality and backgrounds still travel from all over the world to partake of the waters and pay homage to the sacred site today. 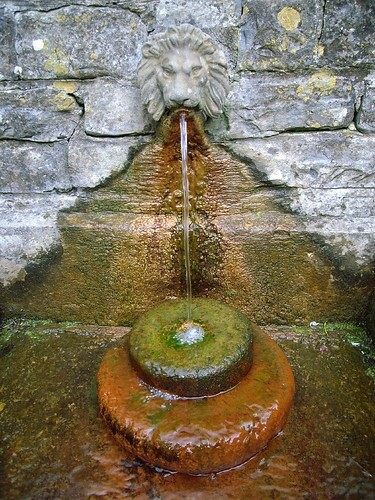 Pilgrims are able to bathe in the waters in the healing pool and to drink and fill bottles with the spring water at the Lion’s Head Fountain. Many myths and legends surround the well, such as the Christian myth that the well marks the site where Joseph of Arimathea placed the chalice that caught the drops of blood from Christ at the crucifixion, which has led to numerous stories of the well and the Holy Grail. It is also associated with the feminine aspect of the deity, with the Tor representing the masculine and is a place of pilgrimage for those people who come in search of the divine feminine. Regular celebratory events marking the Christian and Pagan calendars are held within the grounds, details of which can be found on the Chalice Well website. The water travels down through the Chalice hill and has never failed even during times of drought. The water has a red hue which is due to the iron oxide deposits in the water, which stains the stonework of the pools and fountain and give the water its distinctive taste. Some Christians have suggested that the red is a representation of the rusty iron nails used in the crucifixion. The well, spring Healing pool, Vesica pool and Lion head fountain are set amongst colourful, beautiful and fragrant gardens and orchards that make for a peaceful and serene walk, with ample opportunities to take photographs and numerous private nooks where you can stop to contemplate the world, sketch or write. 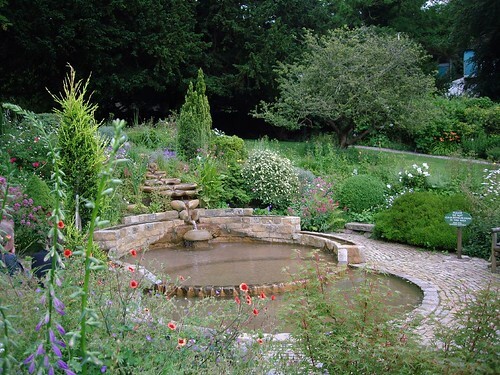 I spent a wonderful afternoon in the Chalice Well Gardens with my Dad there back in the summer of 2007. It wasn’t a planned trip and we ended up going to the Tor and then on to the Chalice Well Gardens, followed by a perusal through the lovely shops in Glastonbury town centre. It was about this time that I started getting serious about photography and you can see the pictures I took of the Chalice Well Gardens on my flickr set Glastonbury Sacred Chalice Springs. 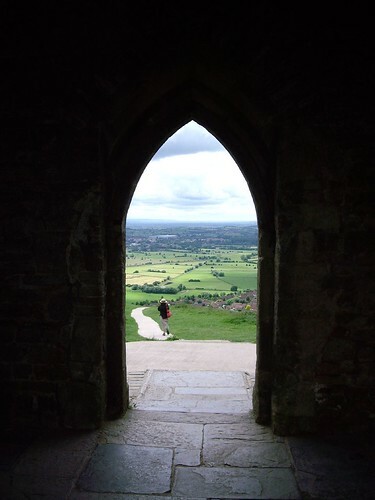 Up on the summit of Glastonbury Tor you can see out for miles over the Somerset levels. It’s a truly magnificent view and well worth the trek up to see it. The Tor itself is striking, rising up out of the plain known as the Summerland meadows and being the only high point within the levels that surround it. Back when the levels were fenland (wetlands), the Tor would have risen up as a lone island. On the summit you’ll find the imposing St Michael’s Mount, a 15th Century Tower, which is all that is left of the church that once graced it. 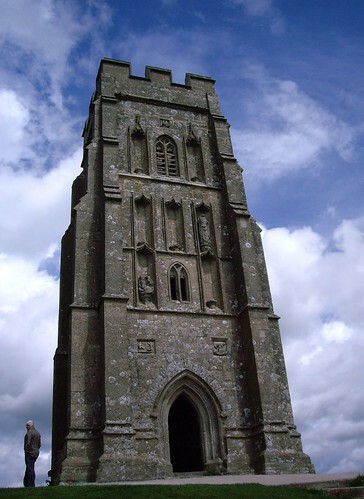 It also has the unsavoury reputation of being the place where the Abbot of Glastonbury and two of his monks was hanged in 1539 during the dissolution of the monasteries. As with Glastonbury Abbey, the Tor has been a sacred place for a very long time and there is archaeological evidence that it was populated as far back as neolithic times and has been inhabited throughout the centuries since. The Tor is now under the stewardship of the National Trust and is open every day of the year and free to visit. It’s not the easiest place to get to by car, but there are regular coach tours run from Glastonbury town centre. As you look at it from a distance and whilst walking up to the summit you will notice that there are seven deep terraces cut into the Tor. These are one of the most enduring mysteries associated with the landmark, with a number of theories having been proposed, but nothing proven. 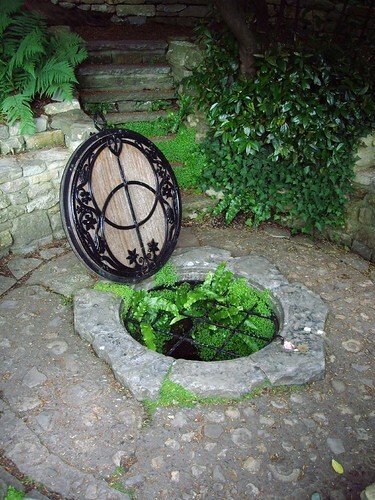 Just like the Chalice Well, there are many myths and legends associated with the Tor, not least of which is the legends around King Arthur and Avalon. Legend has it that the Tor is the Isle of Avalon, or the doorway to Avalon and the world of fairies. In more modern times a myth has arisen around the idea of a grand Glastonbury Zodiac, which is an astrological zodiac said to be carved into the ancient hedgerows and track ways. Standing up on the Tor it’s hard not to feel the presence of the place. The wind whistles around you, clearing your thoughts and imbuing you with a sense of power, coupled with the seemingly unending 360 degree views that give you a sense of omnipotence. It’s easy to see how the Tor has come to represent the masculine elements of the deity. I visited the Tor one summer’s day with my Dad back in 2007. It was a totally unplanned trip, which also included a visit to the Chalice Well Gardens and shopping in the quirky Glastonbury Town Centre. I remember how thunderous clouds threatened to rain down upon us all day, but never touched us. I left feeling energised and reinvigorated after my trip up to the Tor, not to mentioned inspired. I found myself fired up with a burning creative energy which I channelled into my burgeoning hobby of photo editing/manipulation of the photographs I took that day, which you can find in my Up on the Tor flickr set. 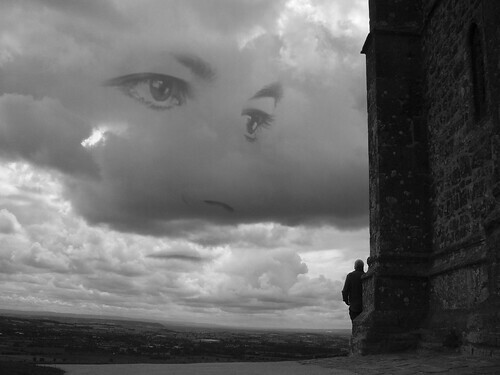 That concludes my places of pilgrimage in Glastonbury and indeed my places of pilgrimage in the UK. I hope you’ve enjoyed your trip through my memories of these sacred spaces and beloved places that I make pilgrimage to. If I’ve inspired you to visit just one of the places I’ve written about then I count myself very lucky. *For more info about Seededbuzz check out their website or my article Seededbuzz – A great resource for promoting your blog! This entry was posted in My Blog, My Travels, Photography, Wealie Nice Places to Visit and tagged childhood memories, childhood places, countryside, english countryside, Glastonbury, Glastonbury Abbey, Glastonbury Chalice Well, Glastonbury Chalice Well Gardens, Glastonbury Tor, nostalgia, photo, photography, Pilgrimage, places of pilgrimage, remembrance, ruth weal, The Chalice Well, The Chalice Well Gardens, Tor, travels, UK, wealie. Bookmark the permalink.